Newly promoted Chief Boone Drake has endured more than his share of hardship. After losing his first family in a fire, being shot in the line of duty, and uncovering the betrayal of a fellow officer, The Breakthrough by Jerry B. Jenkins finds Boone in yet another high stakes predicament involving his new family. His fellow officers rally around him in response, willing to risk their own careers for the sake of their brother in blue. Jenkins weaves a tale of fast-paced suspense so intriguing, he would’ve made even a predictable plot enjoyable. But the reader is kept guessing as Boone’s search for answers introduces new players and leads him as far away as China. Jenkins successfully creates character personalities that are distinct and believable. Although Boone at times seems more together under pressure than the average person, his response to tragedy fits both his profession and the precise way his mind works. Other characters play their part to create a community the reader can relate to–former partner and best friend Jack is loved and rooted for, while friend Florence is loved but annoying. The bond between the men and women in uniform is presented well enough to be felt, and readers will appreciate how Jenkins laces the text with the amusing sarcastic banter that is cop humor. Meanwhile, Jenkins tackles some of the hardest questions about faith, particularly why God allows bad things to happen, and how does one continue to trust Him when they don’t understand their circumstances. 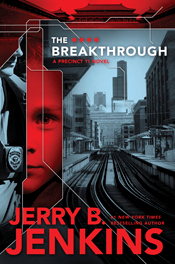 A moving and heroic story of steadfast faith in the face of tragedy, The Breakthrough is a winning finale to the Precinct 11 series. And when readers tune in to find out what form Boone’s breakthrough will take, they just might experience one of their own. I gave this book 5 out of 5 stars. The book sounds like a great read. I had not heard of the Precinct 11 series. After your review, I’ll have to read them all. This book sounds really interesting. I will add this series to the queqe of books that I plan to read. Already read this book as well as the entire series. It was an awesome book. You didn’t get bogged down in it, it flowed easily and quickly. Action packed, great drama, and it kept my attention. I’d recommend it to anyone who likes crime drama.